Villa à Windsor Palms Resort, Kissimmee, Orlando, Floride - Sur Exclusive Windsor Palms Resort, à seulement 5 minutes de Disney. Les infrastructures gratuites pour geusts. Une villa exécutive située à seulement quelques minutes de Disney. La piscine chauffée et le jacuzzi donnent sur une zone de conservation boisée. Le complexe propose un accès gratuit aux installations telles que des courts de tennis, un gymnase ultramoderne, une piscine olympique, un cinéma, des tables de billard et des aires de jeux pour enfants. Idéal pour deux familles partageant, offrant tout ce qu'un hôtel cinq étoiles a et plus. Avec des meubles surclassés et un décor de bon goût, vous ne serez pas déçu. Accès gratuit à Internet haute vitesse. La grande piscine privée, bénéficie de fabuleuses vues sur la conservation. La piscine peut être chauffée pour une petite charge supplémentaire. Salle de bains attenante à la chambre 1 - grande salle de bain, WC séparé. douche, WC séparé. w. c dble vanité. Salle de bains attenante à la chambre 2 salle de bain avec douche, w. c. et la vanité. Salle de bains 3 - w. c., la vanité hors de la zone de la piscine. Salle de bains 4 salles de bain avec douche, w. c. et la vanité. Notes sur l'hébergement: Les enfants adoreront les chambres à thème, nous avons une chambre à thème Disney Frozen parfaite pour les petites filles, un Star Wars thmed chambre idéale pour les garçons et les enfants plus âgés adoreront la salle de sport américaine. Avec enfants à l'esprit, un lit, chaise haute, poussette et moniteur pour bébé sont fournis. Dehors: La piscine chauffée et jacuzzi privés donnent sur une zone de conservation boisé. Il ya des meubles de patio amplement y compris tables chaises et des chaises longues. Un barbecue est fourni. Buanderie: L'équipement dans l'utilitaire comprend grande machine à laver automatique et sèche-linge, le repassage des vêtements de société séchoir et le fer. Service de nettoyage / serviettes / / Femme de ménage: Tous les draps et serviettes sont fournis. Le nettoyage est entre les laisse. Le nettoyage peut être organisé pour les séjours d'une semaine ou plus pour un coût supplémentaire de 60 £. Accès internet haut débit gratuit. Autres: Salle de jeux avec table de billard et de hockey de l'air. Nice gated area, close to the Disney parks. Easy driving to and from. This house is huge, and ther price was nice. The private pool and hot tub are great. 3 showers to speed things up in the mornings. I will always rent a house for a vacation, it's actually cheaper than a hotel with may more benefits. I would rent from this owner again. I left a small list of maintenance suggestions, hopefully they will fix up. Nothing big, just trying to help out. If I could suggest one upgrade, the TV streaming service is about 30 years back in technology. Current would be hdmi, before that was rgb cables, then s video, then red yellow white, then what we have here is coaxial cable. One step after bunny ears. Poor quality feed blown up on a big flat screen is quite noticeable. But I'm also a theater surround guy. Luckily I didn't have much time to sit around and watch TV. Would recommend property to friend and friend . Buy we did not get soap,tissue,little hand lotions but other than that we enjoy the house no major complain.. 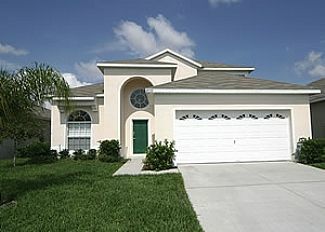 The location of the Villa is excellent, close to Orlando International Airport, theme parks, shops and restaurants. The Villa in relation to size, rooms and facilities are also excellent and suited 14 of us who stayed there for two weeks. What was disappointing, however, was the overall state of the villa, it could do with some minor work and some TLC. One bedroom, with the bunk beds in, had no air conditioning at all and in temperatures of 90+ only the electric fan from the garage made that closer to comfortable not being able to shut out the sun at all made this room unusable without the fan.There was water damage on the room of the lounge, some cupboard doors were hanging on one hinge, the fridge freezer was working but the plastic door was cracked and a piece broken off. Blinds in the sitting room and main bedroom were broken through sun damage / exposure. Stains on carpet and cupboards, coffee tables etc and general upgrade is required. In general it was good value for money but some minor work and TLC could return this villa to excellent. The home is nice and well kept. I took my family of 13 with us for a week stay. Especially pleased with the home and location. HOWEVER upon arriving the house was extremely hot inside and the AC was set at 75 with a note attached to the thermostat which stated that it was not to be lower than 75 as the unit would freeze and the renter would have to pay the cost. The house is two stories, the heat in the upstairs rooms was unbearable for the children as one of the rooms had no curtain on the upper window and the heat from the day penetrated the room making it extremely uncomfortable. I had to go out and purchase fans in an attempt to lower the temperature. We also purchased black plastic and tried to place it where it would block the sun from penetrating the room raising the heat even more. There were times in the house the temperature was above 80. 13 people in a house, 80 degree inside and no way of lowering the temperature was frustrating. I understand that there is a need to keep utility costs down however 75 is an unacceptable level to maintain when paying for such a large house. Had I known this I would never have rented the home. A larger unit might be considered. There were a few other issues which the home owner could have had corrected however the only real concern was the 75 degree thermostat requirement. The temperature in the house never went below 75 the whole time we were there and we were there for 6 nights. avec des miles de plages de sable doré. La villa est à environ 15 minutes en voiture de l'aéroport international d'Orlando. Windsor Palms Resort est à seulement 10 minutes en voiture des stations de Disney - toutes les autres attractions sont à seulement quelques minutes. Centre spatial Kennedy est d'environ 1 heure de route. Formosa Gardens Shopping Village avec les supermarchés de 24hr, restaurants et boutiques spécialisées se trouve à seulement 5 minutes. Le 192 avec ses nombreux magasins et attractions sont à une courte distance en voiture. Booking Notes: A security deposit of £200 is req. for each booking. Changeover Day: There are no restrictions on guests leaving/arriving. This may be on any day.